Recently is finishng two CD’s– Great Romantic Cello Concertos together with Slovak Radio Symphony Orchestra with the interpretation of Tchaikovsky, Saint-Saens, Schumann and Paganini. Other CD, which will feature the complete cello output of extraordinary Slovak composer Tadeáš Salva will be realised by NAXOS. His last CD for DISKANT label – „Visions“ – Slovak Music for Cello and Accordion (together with Rajmund Kákoni ), with the the pieces written by outstanding Slovak composers especially for that ensemble, went out on January. 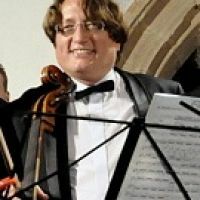 Eugen Prochác has shown his talents as an organizer and manager in establishing the international Festival of the Nice Music in city of Banská Štiavnica - UNESCO city, Slovak republic in 2000. He is an artistic director of the festival . In 2001 he was artistic advisor and soloist at first Al Ain Music Festival in United Arab Emirates as well as in Mozart Istanbul Festival this year.